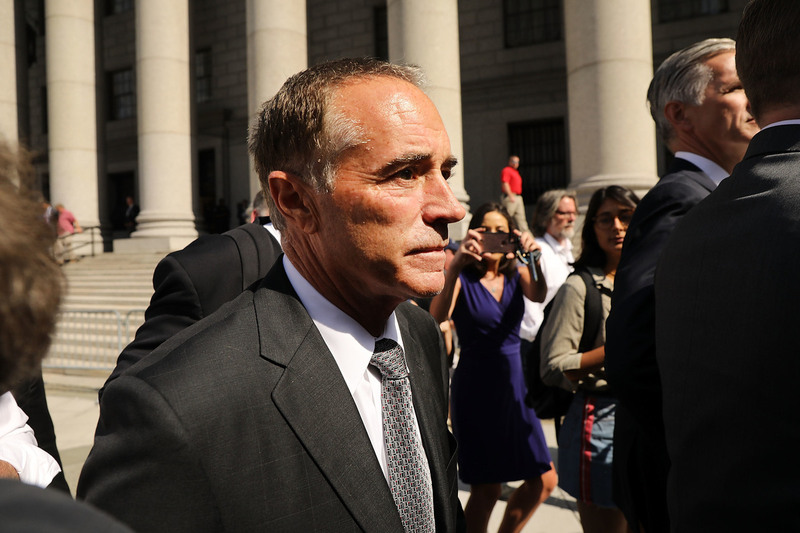 Indicted Congressman Reverses Course, Says He Will Campaign For Re-Election Rep. Chris Collins was indicted on insider trading charges in August and suspended his campaign. Now he is running again, saying "the stakes are too high" to allow a Democrat to win. Rep. Chris Collins, R-N.Y., walks out of a New York courthouse on Aug. 8 after being charged with insider trading. Collins suspended his congressional campaign after the indictment but has decided to resume his re-election bid. An indicted New York congressman who had announced he was withdrawing from his race has reversed course and now says he will continue to campaign for re-election and plans to serve again if he wins this November. In a campaign statement announcing the decision Wednesday, U.S. Rep. Chris Collins, R-N.Y. said, "The stakes are too high to allow the radical left to take control of this seat in Congress." Collins was the first member of Congress to endorse President Trump in 2016. Until the indictment, Collins, who is among the wealthiest members of Congress, had been cruising toward re-election in his heavily Republican district outside Buffalo. Collins was indicted on insider trading charges in August. He then suspended his re-election campaign. Until Monday, Republican leaders from across the 27th Congressional District had been meeting with candidates interested in taking his spot on the ballot. On Monday, Collins announced that on the advice of his criminal attorneys he could no longer cooperate with the efforts to have him seek some other office to swap him off the congressional ballot. After the news of Collins' decision to stay in the race, his Democratic challenger, Nate McMurray, said in a statement, "Chris, if you're listening from Manhattan, here are a few words you may remember, 'lock him up' 'drain the swamp'. I hear your next court appearance is on October 11." In August, the Justice Department filed charges against Collins; his son, Cameron Collins; and Stephen Zarsky, the father of Cameron Collins' fiancée, in an alleged insider trading scheme. The charges stem from his holdings in Innate Immunotherapeutics, an Australian biotechnology company on whose board of directors Collins served. He was also one of the company's largest shareholders, according to federal prosecutors. According to the indictment, Collins passed on information about a failed drug trial to his son, Zarsky and others. By selling stock before the results of the trial were publicly released, the three men and other unnamed individuals avoided $768,000 in losses, prosecutors say. The indictment triggered an independent investigation launched by the House Ethics Committee, and Collins, his son and Zarsky also face a civil lawsuit filed by the Securities and Exchange Commission. Collins is one of two indicted members of Congress running for re-election this fall. Rep. Duncan Hunter, R-Calif., was indicted last month on charges of misusing campaign funds for personal use. Democrats are making use of those indictments, as well as ethics scandals surrounding Trump and his campaign, as a key plank of their fall campaign message.